You are running late again, you're tempted to splash out on takeaway pizza but that's setting you back at least £20 no matter what way you look at it. Make a pizza in less time it takes to phone a delivery order though by just preparing a little on your next supermarket shop. I usually shop at Aldi, I find their stone bake basic pizza tastes fine, I just make sure I have one in the freezer at all times. 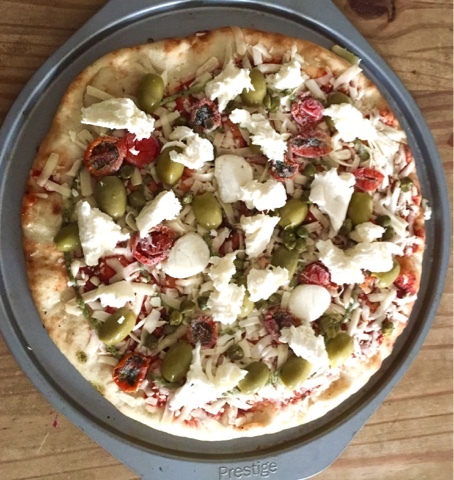 Tesco have a fantastic gluten free margarita pizza in the freezer section of larger stores. Asda have some super pizzas made in store which are perfect for a fakeaway as they come. If you are really prepared you can preprepare a home made base with a tomato sauce for a few pence but you can buy a pizza in a supermarket for £2-£7 depending upon size and quality. I always have a mozzarella in the fridge. The cheaper ones are fine for a pizza and cost between 50p and £1. If you aren't sure when you will use it, splash the cash in a block or some balls which are just fine to freeze. I always have a jar of olives and capers in the fridge so add the mozzarella and these as toppings but basically go with what you have. Total prep time 5 minutes then cook as per instructions. When I'm making a pizza 'fake away' I usually serve with some garlic bread which I buy pre prepared from any supermarket and freeze and/or some wedges which I make from new potatoes cut into 4 and then put in the oven. The wedges take a little longer than the pizza so put these in first while you prepare the pizza. Total prep time 10 minutes max, add another 15 mins or so for the cooking. Quicker than a takeaway and at approximately £5-6 to feed a family of 4 much cheaper than a takeaway too!